Egg Cave is excited and proud to announce that we, as a site, will be transitioning away from being an adoptables creature site and are instead becoming a new battle royale game! Egg Cave is becoming Eggnite. At its core, Eggnite is about the last creature standing. Starting tomorrow, users will have the ability to kill other users' creatures. If and when your Cove is completely wiped out, your account will be automatically closed (your username will be freed up). To participate and hop back into the game again, you'll be able to register a new account. When a 1st place winner is crowned, the entire game resets (all EC, all items, and all creatures). We will mention that you'll always be able to reach for Resurrection Stones as long as your account has at least 1 creature alive. Bringing back creatures means your account can stay in game longer, of course! Eggnite will now introduce randomized loot boxes into the gameplay called Cave Crates. Cave Crates are Eggnite's new way of obtaining creatures. It will eventually replace the current Cave approach and steal system tomorrow. Users find crates and need to open them to get a creature hidden inside at random. Starting today, you can begin collecting Cave Crates when you see them around the site (similar to our annual Find The Gobblers event). When you see one on the page, click it to collect it for your account! How do you get keys, you ask? These will be exclusively Cash Shop items only, beginning at 100 CC. They launch and will be available for purchase tomorrow, April 2. Prepare for the conversion to Eggnite tomorrow—the battle will begin and no creature is safe from being targeted. Today, collect Cave Crates around the site as they appear on the page. Beginning tomorrow, you can purchase your Keys in the Cash Shop to open them for creatures. We hope you enjoy this exciting new change. We're moving away from only adoptables to something with a TON of ACTION! April's Cash Shop Monthlies are the Floodeer and Aries. The latter is originally designed by @achimenes. Thank you for your contribution! April's Cave Monthlies are the Krusdot and Kettu. The former is originally designed by @shadowfaxe, with the Archives entry written by @prairie. Thank you for your contribution, too! It's back! The Prankey is available seasonally, April 1-3. Find yours at the Cave. 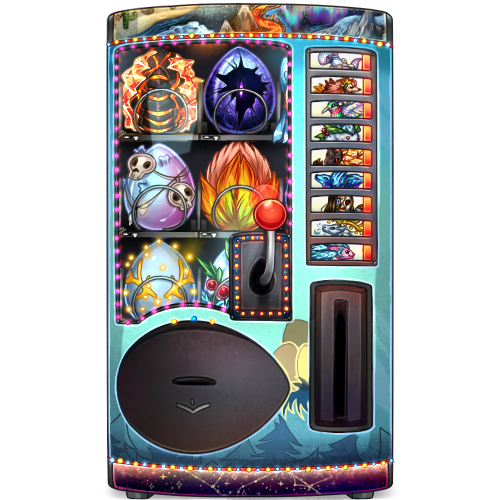 Congratulations to @anna16 and @alphawolf14 and @vilitrance, the winners of drawing 2 for March 2019's Cash Shop Creature Lottery! A Manekii has been added to each of your accounts. Today is the final weekend that you'll be able to visit Dragold's Den every 15 minutes for unique power ups and prizes. Have you been able to achieve all that you've been hoping for from the event? This is the last weekend of March which means that March's Cave and Cash Shop Monthlies will only be available for a few more days. Be sure to pay the Cave and Cash Shop Park some final visits before April 1. Yes, these coins are indeed EDIBLE! Find these ready-to-eat coin skewers restocking at the General Food Store. Pangy has even mentioned in the latest edition of the Ark City Times that the coins were found at the end of rainbows and are locally sourced just outside of Ark City. Can you even believe? Wait... is this actually the Manekii? Is it a lion or is it a unicorn? The Toy Shop is now carrying these new plushies for your critters to play with! There are two brand-new St. Patrick's Day-themed prize pools available from The VEND Machine. Collect your tokens and then spend them as you please! The first prize pool is a collection of St. Patrick's Day creatures from March of 2011... it includes the Flover, Shillas, and Luckuar. 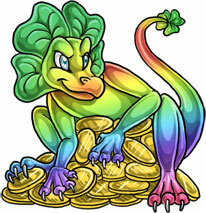 The second new prize pool features St. Patrick's Day creatures from March of 2013... the Clioney, Dragold, and Trovantis have returned. Just when you thought you had enough. Nope! There's more in store. These Travels are now restocking at the Travel Agency. Find them there and get yours today! Three VEND Machine prize pools have just been retired from quests. Remember that prize pools can retire at any time for any reason. More new prize pools are on their way! Make sure that there's not a leprechaun inside of this mug before you start drinking. Find these new coffees restocking at the Bean Sack! Have you been visiting Dragold's Den each day for special prizes and account power ups? The event continues through March 31. Happy St. Patrick's Day to all of our lovely Egg Cave players! We hope that you're able to do something for yourself or with friends to celebrate. Every year around St. Patrick's Day, the Dragold's Den is opened for all Arkians to try their luck. You can visit Dragold's Den once every 15 minutes for prizes and special account power ups. Occasionally, the Dragold does get greedy and he might steal some of your Egg Coins, so be careful! EC stolen: Dragolds are known for being greedy! Watch out! Visit Dragold's Den once every 15 minutes through March 31. The Clorgi is the newest species to be a seasonal Dragold's Den-only prize! You have a chance of receiving it each time you visit (although it's really rare, so keep at it!). This adorable critter is the product of a collaboration between @prairie and @birdlover64. Many thanks to them both for submitting this as a creature suggestion under the Fan Art & Creature Suggestions forum—the first of its kind has been added to your accounts free. The following Travels are no longer available as prizes from Dragold's Den. They were among the first prizes to ever be offered by Dragold's Den from previous years. They are also some of the oldest items on the site.